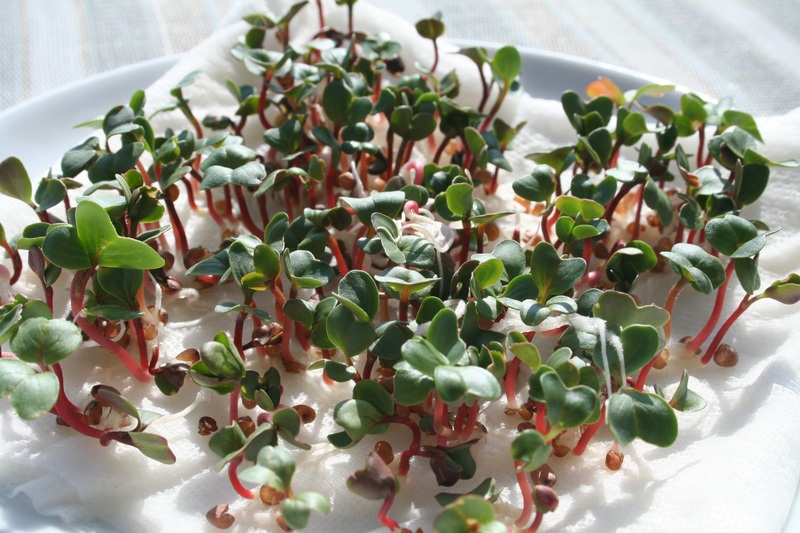 I got hooked on these cute little radish sprouts they sell at the MonsterMart in Emden and when we were in Haugesund I went looking for them at our local MonsterMart. I found them hidden in a three pack, the last one on the shelf, the first day I went shopping. A few days later I went back and they had not restocked and even removed the little tag from the space they had formerly occupied. As is consistent with every MonsterMart there is no point asking the staff as there are only teenagers at the register and they think pizza is a food group. So, I decided to take matters into my own hands. “Grown your own darn sprouts you lazy so and so, you learned how to do that in Girl Scouts.” my conscience said. Fold paper towel so it is within the confines of the saucer and get it nice and wet. 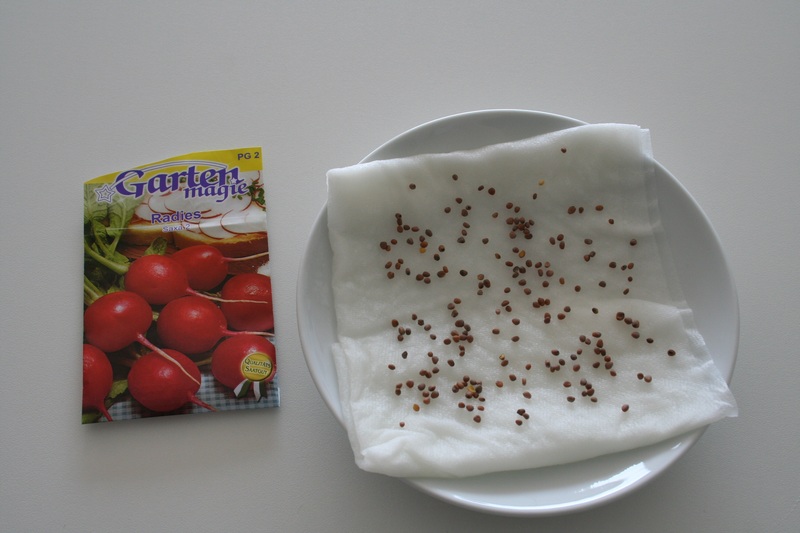 Place the seeds on the paper towel and space them out. Cover with a damp paper towel. Remember to wet the paper towel down daily. I totally dropped the ball here. Please try to imagine what they might have looked like between Day 3 and Day 5. It might be hard because a lot happened. Sorry about that. I was pretty proud of my sprout production until I started to put this together for this blog post. Then I started doing some research, the above method IS NOT the preferred method for growing sprouts just so you know. I did almost everything wrong. The more I read, the more convinced I became that we would probably die slowly from our sprout consumption yesterday. Didn’t soak the seeds overnight. Not sure if this is just to get the germination started or if this is to rinse off contaminants. Not so bad. 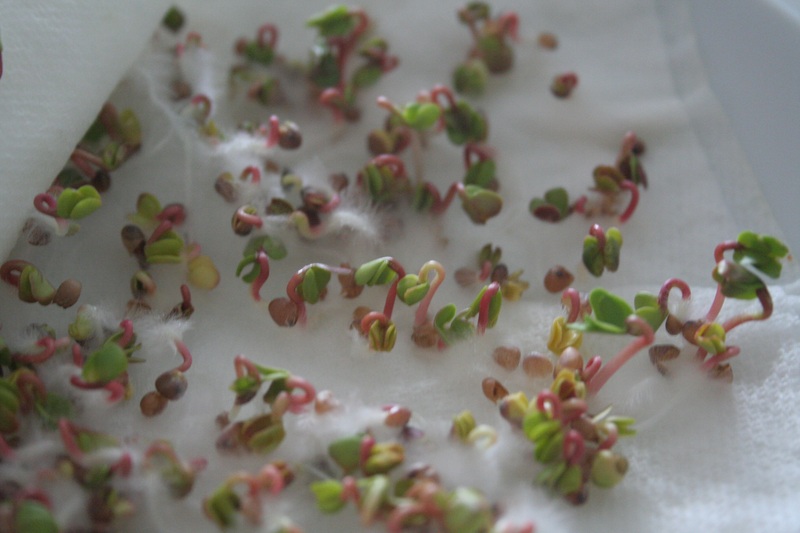 Use commercial growing seeds for sprouting. Commercial seeds can contain anti-fungals that might not be super healthy to eat. Could be very bad. Using tap water to water my seeds. I am resistant to the idea that this was really wrong. It seems ridiculous to me that I need to use filtered water to rinse and water seeds. Of course, if your tap water is not drinkable this does seem reasonable. 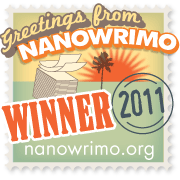 Not bad for us. Letting my seeds stay wet. 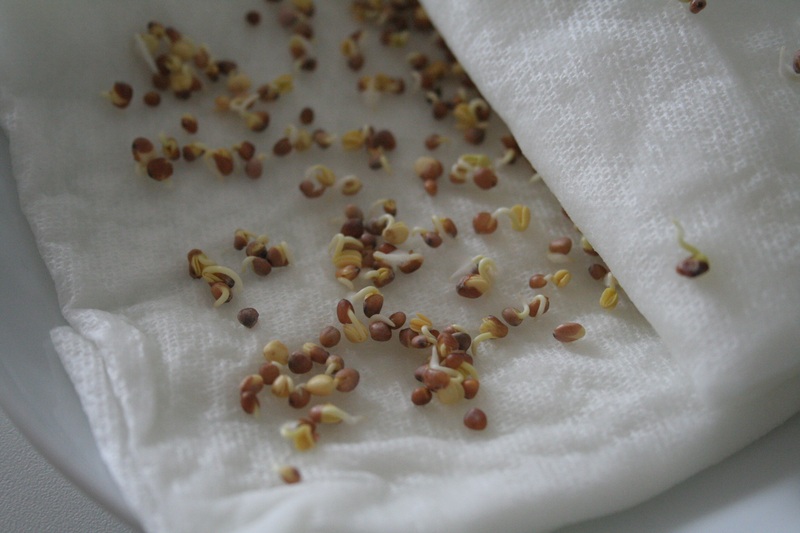 The paper towel created a buffer between the water and the seeds but too much water could cause bacterial growth on my seeds. Could have been pretty bad. Yuck! All this anti-sprout propaganda makes me wonder who benefits from us not eating sprouts? The material I read, mostly American, says that it could be dangerous to eat sprouts because of E.Coli and Salmonella contaminants but if I remember correctly that was due to store-bought sprouts. None of the German or Norwegian articles mention this, which leads me to believe that this is a problem that does not apply in Europe. So, what I should have done, was grab an old-fashioned glass jar with the lid and metal ring in separate pieces and some cheesecloth and grow my seeds in there. This video will show you quick and easy how to do it right, as well as demonstrate the increased energy level you too can experience after eating fresh sprouts. 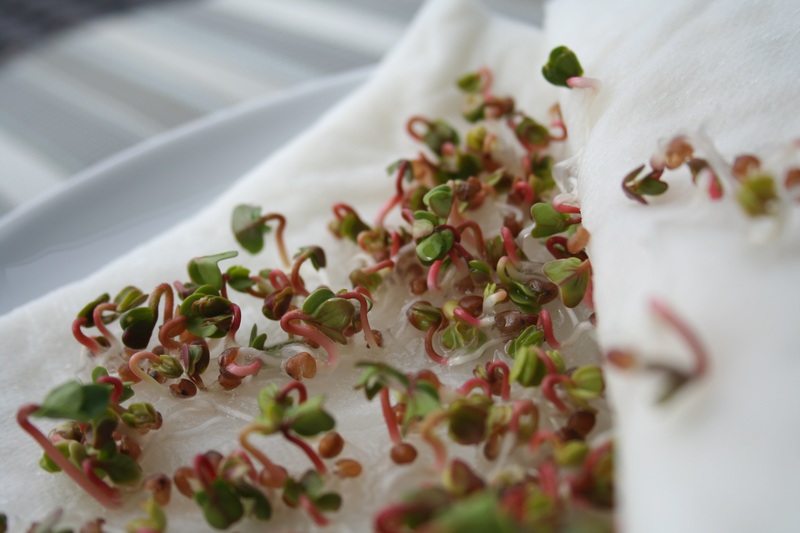 Here is a written explanation of the DIY Mason jar / cheese cloth method Grow your own salad sprouts. Alternatively, you can use a fancy plastic shaker jar or a multi-leveled tower that they sell at the local health food store. As concerned as they are about contaminates on their seeds and water, these hippies seem indifferent about growing their food in plastic. Whole foods or any Co-op or Organic food store has probably got this covered or you can check out the Sprout People. They seem pretty cool! 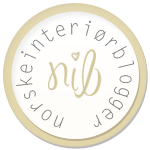 Norwegian KK – Women and clothes magazine recently recommended sprouts. Bama Norway’s largest distributor of fruit and vegetables, disappointing only sell Alfalfa sprouts. Sunnhet, Velvære og Vitalitet make a good case for why you should sprout. SanaBona seems to have the market cornered with both reasonably priced equipment and organic sprouts. Bo Grønt carries a decent selection of seeds and equipment. Alt Shop had some equipment and a few varieties of seeds. 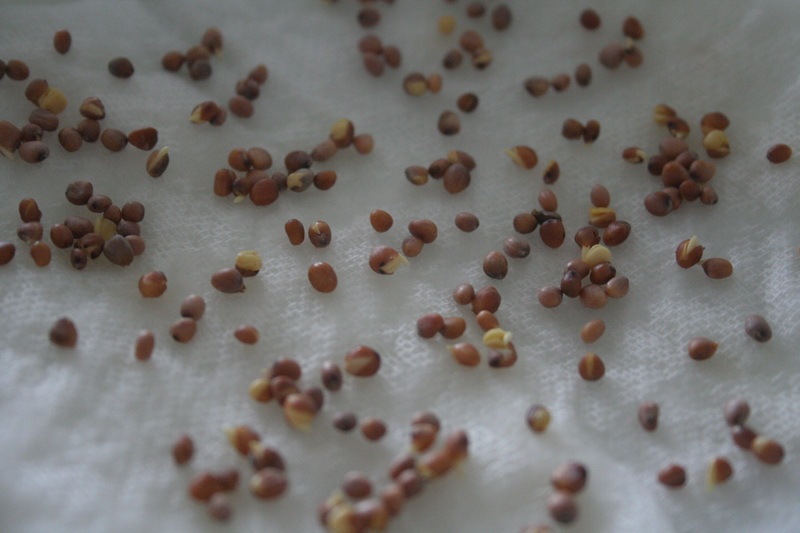 Sunne saker has a small selection of sprouting seeds. I was searching for Keimsprossen or Keimling Samen. Finished product sold by SprossenParadies or Tauge. BioForce had most everything you would need to get started and Amazon.de carries their stuff! Yeah Amazon! A. Vogel BioForce Seeds and Equipment. Did I cover all the bases? We have now disposed of our “bad” sprouts in our BioHazard container and I will be getting some organic sprouting beans in the mail soon!